Confession: I recently broke my year-long Walmart fast. On purpose. I made this purchase for two reasons. First, because I needed the items. And I’d come to realize I could not buy them affordably in my town unless I shopped at Walmart. Secondly, because I was afraid to do it. I am not afraid of very many physical things—snakes, tornadoes, bad men. But when I began dreaming about shopping at Walmart, dreaming of being found there by my church people, I realized I was afraid—and I knew that had to change. I don’t believe in coddling fears. Physical fears, I mean! Relational fears, I just wrap them up snug and sing them a lullaby and hang a big sign around their necks “DO NOT DISTURB.” But physical fears I like to shake up. I was afraid of two things. I thought it hard to publicly shun Walmart for a year and then be caught there. So I was afraid of public opinion. And I was afraid because as the consumer, I felt myself to be the apex of a triangle, with all the blood of the oppressed weighing on my shoulders. I was afraid of private guilt. The truth is that I miss shopping at Walmart. The American department store is a modern day wonder. It’s easy and fun; in one amazing place I can find nearly everything my family needs. No bundling kids in and out of car seats; no chain of unsuccessful stops. I like comfort and simplicity, and I was afraid I’d stop caring about that lady in China whose face I cannot see, and start caring only about what was easy for the Zooks. So I checked out with an elevated heart rate and shaking hands. (Stop laughing. I’m being kind of serious here.) I recognized my cashier. She’s worked this Walmart for 15 years. “Are you allowed to accept a tip?” I asked her. No, she was not. Compliments yes, tips no. Got home safely. Whew. Big sigh. And then I realized I’d bought the wrong sizes. Two belts and a pair of pants would have to be exchanged. Only one place that’s happening, babe. I feel God pushing on me. Can you do this thing and shake your fear? Good. Go back again. I want to make sure. I don’t want to root my choices in fear for long* — even the most moral choices, larger than this one. Fear paralyzes: fear of man, fear of culpability, fear of contamination. Fear was designed as a powerful short-term motivator. It’s not a safe guide for long-term decisions. *Except, you will say, fear of God. That is true. But His is a fear that empowers. Walmart is easy to target because it’s big–the culprit that throws its weight around. But it’s not a single-handed antichrist; it’s a reflection of the world in which we live. 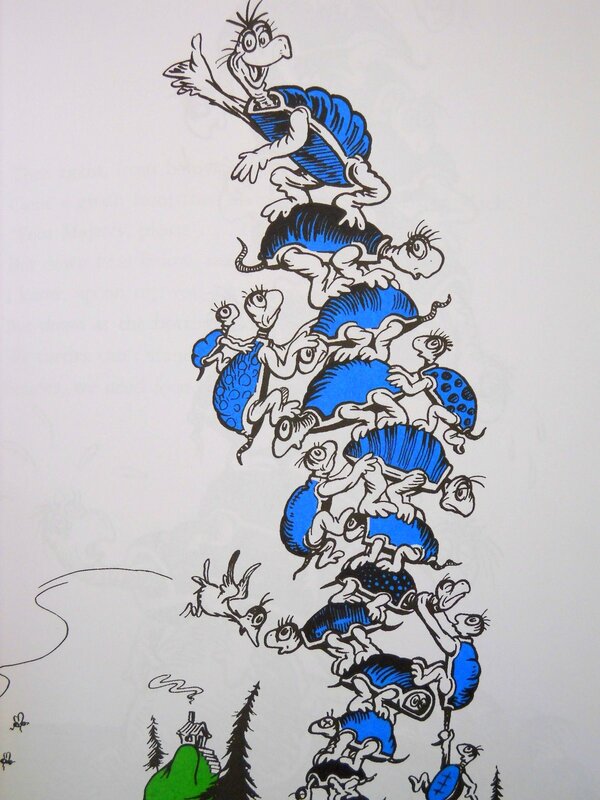 It’s Yertle the Turtle perched atop a stack of other turtles, but none of them want to return to the pond. Ninety percent are clawing their way to the top on the backs of others. Are the other places I shop better? Do I have the power of choice I’m imagining? Very interesting post(s). Love the Yertle the Turtle analogy. And the level of fear you had–very intriguing. There are no easy answers. The berries at the mom-and-pop store may well have been picked by underpaid Mexican children or the alarm clock made by prisoners in China or the drumsticks grown by sad anemic chickens locked in cages their entire lives. You can go crazy trying to figure it all out. There is no single Big-and-Bad that can take all the blame, I know that. A few of my goals are: provide for my family, have time to serve others, use money wisely, shop locally, shop second-hand, cook and sew from scratch, reduce my hunger for STUFF. The balancing act: I buy prescription meds at the little local pharmacy in Harrisburg except for AdVair which is $180 for a month’s supply, so I order it from Canada for about half that. I like to have a garden but didn’t last year since we spent the month of June at a Bible school in Thailand. Sometimes buying a pizza means more time for church work. I never feel like I totally get it right. I hope you write more on this subject. I really like where you’re going with this subject… (or where I think you’re going). ” I like comfort and simplicity, and I was afraid I’d stop caring about that lady in China whose face I cannot see, and start caring only about what was easy for the Zooks.” – I like what motivates your decision to stay away from Wal-Mart and I think you’re pretty awesome for staying away for a whole year! I do wonder about the sustainability of not shopping at department stores like Wal-Mart/consistently supporting local businesses and purchasing fair trade/etc. I do, however, believe that every little concentrated effort matters…no matter how small. This is an issue, it seems, that would be hard to completely implement as a manner of lifestyle.